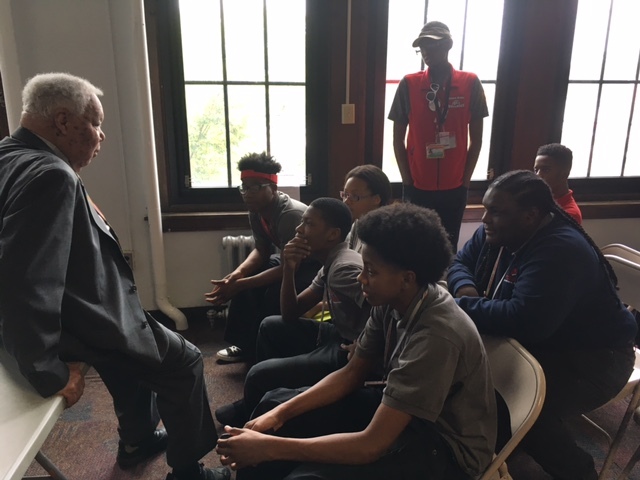 On Thursday, May 4th, William Akers, a 1949 graduate of Simon Gratz High School and a graduate of Temple University Law School, came back to Simon Gratz to and speak with students about his career in social justice. Mr. Akers had breakfast with principals and several Gratz alumni leaders before hosting speaking sessions for 7th-12th grade students in the library. Mr. Akers is a former private practice lawyer and Federal Administrative Judge. Known as the “Black Power Lawyer,” Mr. Akers worked with the Student Nonviolent Coordinating Committee (SNCC), NAACP Legal Defense Fund, The Black Panther Party and The Congress of Racial Equality. He also served as a board member and President of the Nicetown Boys and Girls Club.